When a couple of my friends mentioned they were doing the Great North Bike Ride, and I had a cycle rather than a run planned this Sunday I figured it would be good to challenge myself to a longer distance bike ride and have some fun. The ride, in aid of local cancer charity The Chris Lucas Trust promised 57 miles of relatively easy riding in the Northumberland countryside with bike support, a couple of feed stations with water and bananas and plenty of places to stop for a snack. I thought I’d better equip myself with something a little more forgiving than my tri shorts and picked up a bargain pair of padded cycle shorts for the ride; checked my bike over and baked some flapjacks to keep me well fuelled. Bike checked over, I was set for an early morning wake up call to get to the meeting point where the organisers would pick us and our bikes up to take us to the start. Next time, remind me to check my shoes as well as my bike. My friend Karen sent a text to say she was on her way, but running a bit late after having problems with the bike rack. With plenty of people and bikes still milling about waiting to get their transport, I didn’t think there was any danger of us leaving without her. In the end, I think we got one of the last buses and were over an hour delayed in starting off as there seemed to be more people than they had bargained for. We were driven north to Seahouses, a beautiful little fishing village on the Northumberland coast. As we approached, we saw groups of riders already setting off in the sunshine. 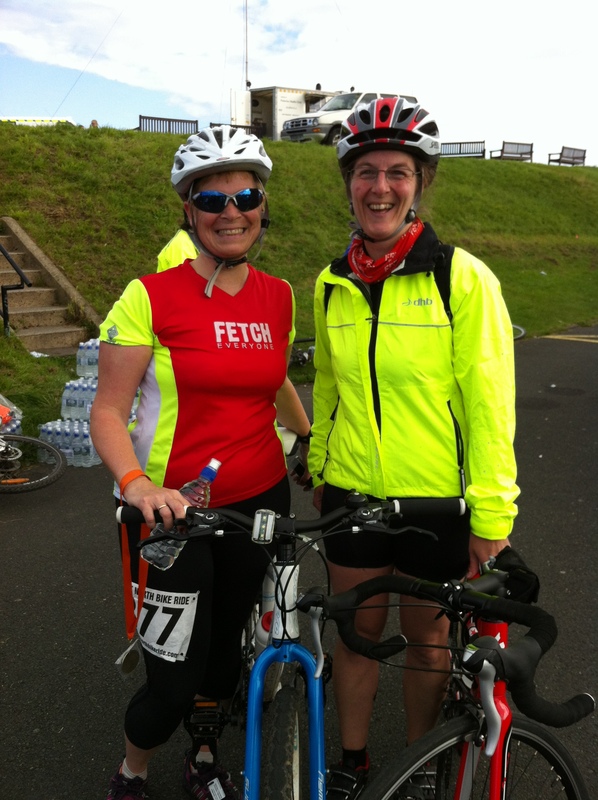 But this wasn’t about racing, it was just about enjoying a day on the bike and a chance to cycle with some lovely views. We were further delayed as we managed to get to the start before our bikes, but eventually, after a good bit of faffing, we were off. I stuck with Karen and her husband Andrew for a while at the start, but with clear open roads and my road bike just gliding along beautifully they encouraged me to go on ahead. I had a backpack full of stuff to cover all weathers and as we’d got a bit chilly hanging about I was layered up for the start. But, as predicted, within 20 minutes I was roasting and stopped to remove some of the extra garments. Karen and Andrew passed and then a bit further down the road I overtook them again. This was to be a repeat pattern throughout the day. As we’d set off towards the back of the field, there were often times when I was out riding on my own, with no sign of other riders nearby. I’d catch up to small groups or couples and pass them, expecting to see another group of cyclists ahead, but then see no one for a while. But I was enjoying the freedom and simple pleasure of a perfect day for cycling. Not too hot, just a slight breeze to keep you cool and long, easy roads with the sea to the left and golden fields to the right. I was amazed how quickly I passed through 10 miles. Even taking it easy in terms of effort on the bike, it felt like hardly any effort at all. But shortly after that I was to start my adventures. The route was marked by signs and the occasional marshal, but was largely a straight road following the coast line. As I turned into Alnmouth, I came to a roundabout at which there were no signs, and no other riders in sight, so I carried straight on. And up a great big steep hill. Ouf! That was a bit of an effort, but still there had been another steep little climb just previously, and I didn’t expect the route to be completely flat. I continued following the road and even caught sight of another cyclist ahead, so hoped I was on the right track. But this lead me to another long slow climb, followed by another and then another steep hill and I really began to think that this wasn’t the route I’d have chosen for a group ride. With doubts in my mind, and by now, beginning to feel rather hungry, I pulled over to the side of the road near a big house part way up one of the hills and gave myself a break. No point pushing on, being lost and feeling hungry all at the same time. So I snaffled down part of my sandwich a bit of flapjack and had a good swig of water. That helped settle me a bit. 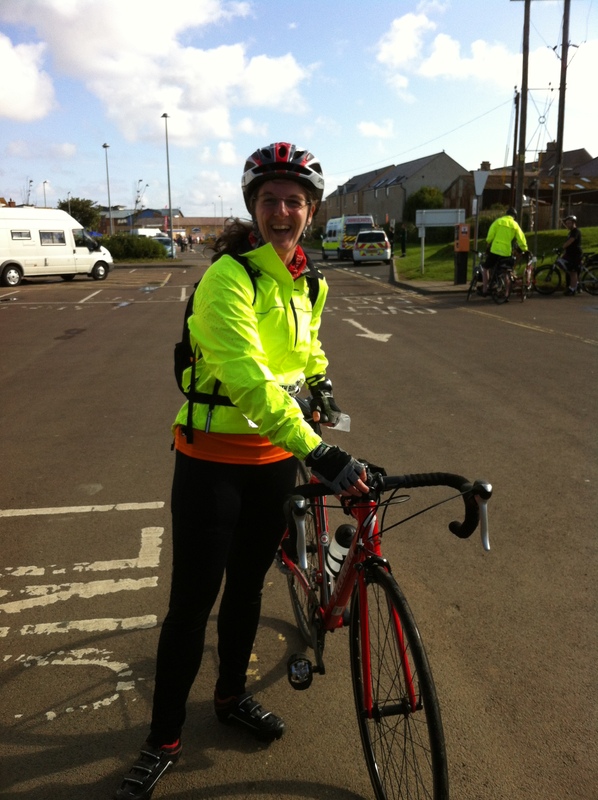 And, not having seen any other cyclists during my pit stop confirmed that I’d gone off track. I could have called the support crew for help, but I decided to push on with my basic navigation skill of keeping the coast to my left. The route took me up and down some more hills until I arrived in Shilbottle. There, a passing cyclist in a Team Sky shirt reassured me that I would be able to get back on track if I carried on following the signs for Warkworth, which I did. I was very grateful to see the van offering bananas and water and know that I was back on the right course, even if I was firmly at the back of the pack by now. The rest of the route was rather smoother and less hilly and I sped up a bit to try and catch some of the other riders. When I caught up with Karen later on, we compared Garmins and I’d done about 5 miles extra. It was a brilliant day to be out in the beautiful Northumberland countryside, diving along tree lined roads or rising up along cliff top roads to catch glimpses of the shimmering blue sea. As we approached Druridge Bay and later Ashington, the routes became familiar from a couple of my triathlons, so it was nice to be able to take a little more time to enjoy the scenery. As we passed through Ashington, we were directed onto a nice smooth tarmaced cycle path that ran alongside the side of the busy main roads. This was a great place to ride, although it was a little narrow in places, which made passing a little tricky, but I was patient and enjoyed feeling like I was flying over the surface despite all the previous miles in my legs. At places, the path stopped to cross a road. As I was unclipping to get ready for another stop, I felt a bit of resistance from my right shoe. When it happened again at the next crossing, I was ready for it and was able to unclip with my left and see what the problem was. My right shoe was jammed in the pedal. No amount of foot jiggling would free it. I slipped my foot out of my shoe and got off the bike to investigate. A couple of other riders who I’d passed on the path stopped to check I was okay and offer help and advice. I managed to loosen off the tensioning for the cleats on the pedals, but still the shoe wouldn’t come free. I was about to set off again, and try to remember that I could only unclip with my left foot, when a cyclist coming back from the finish also stopped to lend a hand. By now, I’d completely removed the tensioning bolts, and still couldn’t get the shoe free. He suggested getting something underneath to prize it away, but my little allen key set didn’t have anything long enough. Then he had the bright idea of using a tyre lever and that did it. As the shoe came free, the problem became clear. I’d lost one of the bolts holding the cleat to the shoe, so it was twisting, rather than releasing from the pedal. I finished the rest of the ride with one foot clipped and one unclipped. After that there were no further adventures. Back on the bike, my legs felt fine and fresh, but my shoulders and back were a bit niggly, no doubt from being leant forward for so long and carrying the backpack all day. 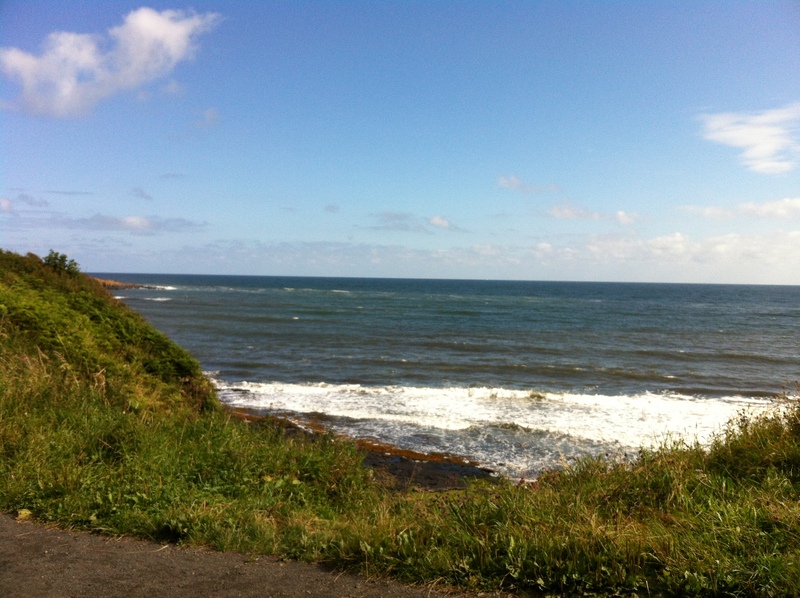 The route took a less pretty turn through the industrial backways of Blyth and then returned to the coast by Seaton Sluice, where my local knowledge took me to the road rather than the cycle path, which is always busy with people walking and seeking out the local ice cream van. Down the hill to St Mary’s Lighthouse and I was on very familiar ground, flying along the coast and trying to avoid getting stuck in the Sunday traffic cruising along the promenade. I’d had no idea how long the ride would take me, and now I knew I was within 3 miles of the finish. I glanced at my watch which told me I’d been riding for just over 4 hours as I passed the lighthouse and shortly afterwards, it went blank – out of juice about 2 miles from the finish. But this wasn’t a ride about pace or speed. It was just a challenge to see how I got on with a significant increase in distance. And although I took it easy, enjoyed a few breaks and a few faster sections, I was very grateful to freewheel down the hill at the end and cross the finish line where I picked up a cycling shirt and medal. I know 58 miles isn’t a great distance by the standards of regular cyclists and many will think nothing of a 100 mile day. But it’s a big step up for me from around the 20- 25 I usually do. I’d worked out on the way that it was roughly half ironman distance and sent my good wishes to Susan who I met at the Northumberland triathlon and was racing that distance in Salzburg. I couldn’t have faced a half marathon after that ride. I was just grateful for the back and shoulder massage that helped ease out some of the knots and a home made chicken tikka masala that awaited me at home. I think I’ve only stopped eating to sleep since! So, yes, I’m very pleased I did it and how much I enjoyed a longer ride. And I’m very happy that my legs and bum feel okay today (the cycle shorts obviously worked). The back and shoulders may be something I have to adjust to for longer rides. Not sure I’d do the event again as some of the organisation was a bit hap-hazard and really I could manage a lot of it under my own steam. But it has reminded me that there are some great places to cycle up here, and just an hour up the road in the car would take me to some lovely countryside to enjoy. It’s fair to say I’m a little bit excited about the Olympics coming to London this summer. As someone who has lately learned the benefits of sport, I will be willing our team GB athletes and paralympians on. And I’ll probably be watching a fair bit more TV than I usually do. I don’t have tickets for any of the London events, although I’ll be watching the football at St James’ Park and I was lucky enough to enjoy my own Olympic experience, running through the Olympic park and finishing in the Olympic stadium. And today the Olympic torch relay came to my neck of the woods. I’ve followed this on and off since it arrived at Lands’ End, dipping in and out of the TV coverage and watching the BBC live torchcam. It’s been brilliant finding out about the inspirational people chosen to carry the torch (and no, that doesn’t include US record producers promoting a talent show on TV). So many great people raising money, coaching sports and doing great things in their local community. I took the day off work and as the relay was approaching the coast at lunchtime, I cycled up to Whitley Bay, the location for many of my runs. It was grey and overcast, but earlier downpours had eased and I began to see people walking out towards the route. I stopped at a random point near a bus stop and locked up my bike, securing myself a good spot to view the convoy from the pavement. There was a great deal of excitement as I chatted to the people nearby and the crowds really began to gather, including scores of very excited primary school children with their union jags at the ready. Soon the police outriders came past, high fiving the crowds and waving. Then came the first stage of the convoy, the advertising buses dishing out sweets, drinks and things to wave and bang. They were accompanied by a bus taking the torchbearers further down the route. This got a huge cheer, and as it slowed down to pass where I was standing, I saw Michael Moore, a colleague from work on board the bus, in his uniform, ready to carry the torch. I wasn’t exactly sure where his stretch would be, but I hoped I had a good chance of seeing it. A little bit of a lull after the excitement of the first stage of the relay procession and then the blue lights and sirens of the main event appeared at the top of the road. First the media bus and then the torchbearer herself waving to the crowds nd getting a huge cheer from the children. She passes in a flash and just a few metres down the road, the flame is passed to the next torch bearer. As the crowds move away, I retrieve my bike and begin to pick my way back down the coast towards Tynemouth. As I cycle along the paths parallel to the route, I spot a torchbearer I recognise as Jonny Miller. Jonny is brother to Stephen Miller, an amazing, inspirational paralympic athlete from Cramlington. I got to know Stephen when he made a film when I was working at the BBC and I’ve followed his athletic success ever since. He’s one of the athletes I’ll be yelling at the telly for at this year’s games. I shouted out some encouragement and rang along beside the road with my bike for a while. I managed to get a bit ahead and spot the next changeover point, where to my delight, my friend Michael was waiting to ‘kiss’ torches and enjoy his moment carrying the Olympic flame. That was a very proud moment for me. To see someone I know carrying the Olympic torch. Michael is a great guy and a keen runner, but he also gives up a lot of his time to coach kids’ football too. I knew it would mean a lot to him to enjoy this amazing privilege. I was soon back on my bike again, my mission to get ahead of the convoy as it turned away from the coast and get to Tynemouth to see it again. I pedalled like fury, taking advantage of the off road cycle paths and then dipping back onto the road when they began to get crowded with people waiting to see the torch. I’d got my bright yellow cycle jacket on and I think some people thought I was part of the convoy. I got a huge cheer and flag wave from a group of children that made me laugh as I passed. I shouted out to some others that they didn’t have long to wait. I made it home, ditched my bike and helmet in the hallway and slipped my trainers on for a smooth transition into a run up to the end of my street, just in time to see the support buses pass by and know that the torch was on its way. 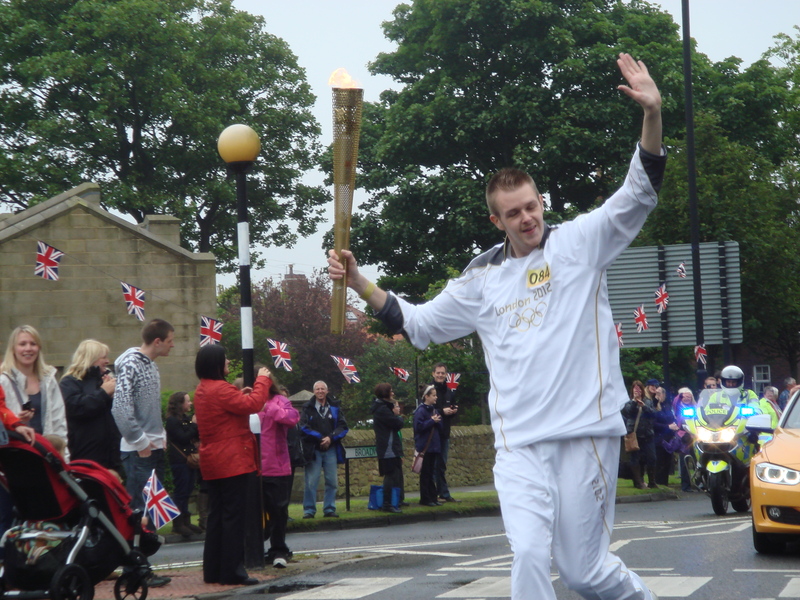 Another flurry of photos, a cheer and a wave to the torchbearer and torchcam bus and I was on the move again, into Tynemouth village. I’ve never seen so many people out on the streets. I didn’t know that many people lived nearby. There were balloons and flags and music and people on stilts entertaining the crowds as the convoy passed down one side of Front Street and back up the other. 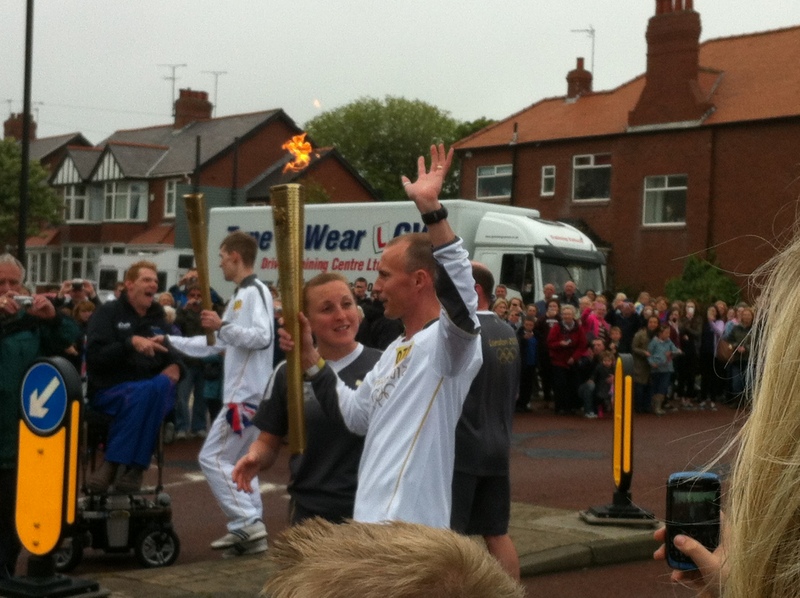 I caught my last glimpse of the flame again as it came past before heading away down the road towards North Shields. And I’ve spent the rest of the day, watching the live coverage, heart in my mouth as Bear Grylls took it on a zipwire over the Tyne, tears in my eyes seeing William Hardy, future paralympic hopeful light the cauldron on the Quayside in Newcastle at the end of today’s journey. The flame has much further to travel through this region and many more moments to come. But today I was proud and thrilled to be a Geordie (albeit not a home-grown one), to celebrate with the people that make this area so special and to add more memories to my store cupboard. Who cares about the weather? It’s going to be a summer to remember.